ETA: Oh, yeah - I changed my blog's background. I like it, but I'm not so sure about the header. More changes may be coming. Actually, I am knitting - I'm about half done with my brother's first real fliptop mitten (as opposed to the prototype) and I've also worked some on my Hedgerow socks, which have been languishing since before Christmas knitting began. I really need socks - all of my handknit socks seem to have self-destructed simultaneously. But tonight I need to tap the collective knowledge of my readers. Do any of you know anything about these? Here's the background: As I'm sure I've mentioned, my ex-husband was military - Army, to be exact - and spent a year in Korea. 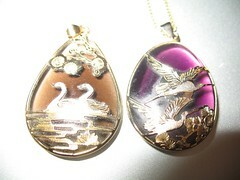 He brought these pendants back for me. I know he was excited about them, and thought they were really cool. My impression was that they were some sort of classical or traditional Korean jewelry. Here are closeups of each of them. They are each about 1.35 inches high by 1 inch wide. 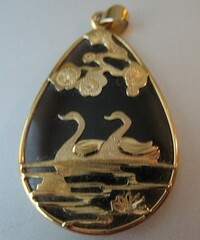 The brown one, with the swans, is more teardrop-shaped, while the purple one, with the geese, is more egg-shaped. Both are convex on both the front and the back. I had totally forgotten about these until I found them today while looking through my jewelry for a couple of rings (which I didn't find). 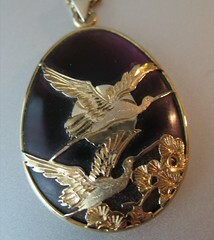 I, of course, tried googling for more information about this style of jewelry, but didn't find anything. Anyone know anything about it? I don't know what they are, but they're cool. O noes about all of your socks!! Can darning salvage any of them? Beats me, but I just sent an email to my sister-in-law, also Army, who was stationed there a while back. I'll let you know if she knows. I don't know anything about them but they certainly are beautiful. Yep, I'm like everyone else, think they are neat, but know nothing about them. Lovely jewelry. This part of the blogmind is ignorant though. Meanwhile... sounds like it's time for a darning party at your house. I've had those. It seems WRONG to use up knitting time darning (heck, that's practically embroidery even if duplicate stitch (which after all is what you're really doing unless you're having to create whole new fabric) is a lot like kitchenering. OTOH... when they're really bad, you can break out the needle-felting tools and stab at them..